SPSS means “Statistical Package for the Social Sciences” and was first launched in 1968. Since SPSS was acquired by IBM in 2009, it’s officially known as IBM SPSS Statistics but most users still just refer to it as “SPSS”. Let’s now have a quick look at what SPSS looks and feels like. After opening data, SPSS displays them in a spreadsheet-like fashion as shown in the screenshot below from freelancers.sav. This sheet -called data view– always displays our data values. For instance, our first record seems to contain a male respondent from 1979 and so on. A more detailed explanation on the exact meaning of our variables and data values is found in a second sheet shown below. An SPSS data file always has a second sheet called variable view. It shows the metadata associated with the data. Metadata is information about the meaning of variables and data values. This is generally known as the “codebook” but in SPSS it’s called the dictionary. For non SPSS users, the look and feel of SPSS’ Data Editor window probably come closest to an Excel workbook containing two different but strongly related sheets. Right, so SPSS can open all sorts of data and display them -and their metadata- in two sheets in its Data Editor window. So how to analyze your data in SPSS? Well, one option is using SPSS’ elaborate menu options. For instance, if our data contain a variable holding respondents’ incomes over 2010, we can compute the average income by navigating to Descriptive Statistics as shown below. Doing so opens a dialog box in which we select one or many variables and one or several statistics we’d like to inspect. After clicking Ok, a new window opens up: SPSS’ Output Viewer window. It holds a nice table with all statistics on all variables we chose. The screenshot below shows what it looks like. As we see, the Output Viewer window has a different layout and structure than the Data Editor window we saw earlier. Creating output in SPSS does not change our data in any way; unlike Excel, SPSS uses different windows for data and research outcomes based on those data. For non SPSS users, the look and feel of SPSS’ Output Viewer window probably comes closest to a Powerpoint slide holding items such as blocks of text, tables and charts. SPSS Output items, typically tables and charts, are easily copy-pasted into other programs. For instance, many SPSS users use a word processor such as MS Word, OpenOffice or GoogleDocs for reporting. Tables are usually copied in rich text format, which means they’ll retain their styling such as fonts and borders. The screenshot below illustrates the result. The output table we showed was created by running Descriptive Statistics from SPSS’ menu. Now, SPSS has a second option for running this (or any other) command: we can open a third window, known as the Syntax Editor window. Here we can type and run SPSS code known as SPSS syntax. For instance, runningdescriptives income_2010.has the exact same result as running this command from SPSS’ menu like we did earlier. Besides typing commands into the Syntax Editor window, most of them can also be pasted into it by clicking through SPSS’ menu options. Like so, SPSS users unfamiliar with syntax can still use it. 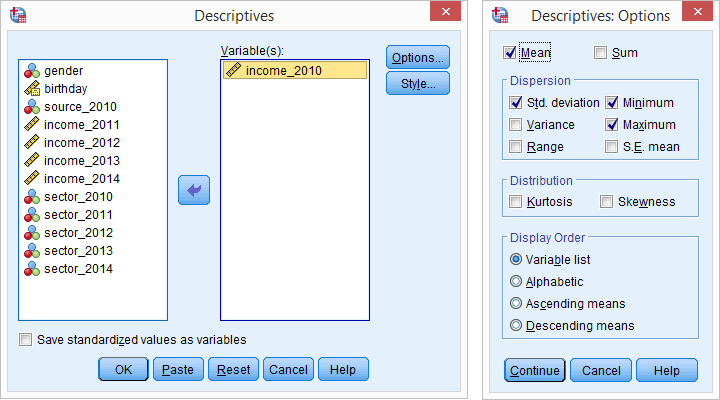 But why use syntax if SPSS has such a nice menu? The basic point is that syntax can be saved, corrected, rerun and shared between projects or users. Your syntax makes your SPSS work replicable. If anybody raises any doubts regarding your outcomes, you can show exactly what you did and -if needed- correct and rerun it in seconds. For non SPSS users, the look and feel of SPSS’ Syntax Editor window probably come closest to Notepad: a single window basically just containing plain text. editing data such as computing sums and means over columns or rows of data. SPSS has outstanding options for more complex operations as well. creating tables and charts containing frequency counts or summary statistics over (groups of) cases and variables. running inferential statistics such as ANOVA, regression and factor analysis. saving data and output in a wide variety of file formats. We’ll now take a closer look at each one of these features. SPSS has its own data file format. Other file formats it easily deals with include MS Excel, plain text files, SQL, Stata and SAS. In real world research, raw data usually need some editing before they can be properly analyzed. Typical examples are creating means or sums as new variables, restructuring data or detecting and removing unlikely observations. SPSS performs such tasks -and more complex ones- with amazing efficiency. For getting things done fast, SPSS contains many numeric functions, string functions, date functionsand other handy routines. All basic tables and charts can be created easily and fast in SPSS. Typical examples are demonstrated under Data Analysis. A real weakness of SPSS is that its charts tend to be ugly and often have a clumsy layout. A great way to overcome this problem is developing and applying SPSS chart templates. Doing so, however, requires a fair amount of effort and expertise. Some analyses are available only after purchasing additional SPSS options on top of the main program. An overview of all commands and the options to which they belong is presented in Overview All SPSS Commands. The options for output are even more elaborate: charts are often copy-pasted as images in .png format. For tables, rich text format is often used because it retains the tables’ layout, fonts and borders. Besides copy-pasting individual output items, all output items can be exported in one go to .pdf, HTML, MS Word and many other file formats. A terrific strategy for writing a report is creating an SPSS output file with nicely styled tables and chart. Then export the entire document to Word and insert explanatory text and titles between the output items. Right, I hope that gives at least a basic idea of what SPSS is and what it does. Let’s now explore SPSS in some more detail, starting off with the Data Editor window. We’ll present many more examples in the next couple of tutorials as well.